Resource Centre > Research Gateway > AUXILIO, Inc. > Is your Managed Print Services program sustainable? 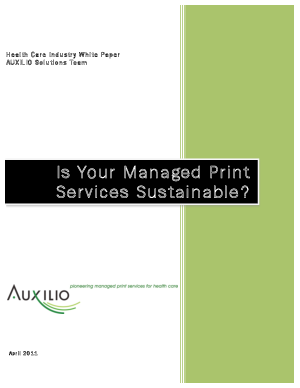 The white paper entitled 'Is your Managed Print Services program sustainable?' examines the greater value of continuous process improvement methodology and standardization of workflow for managing change in a patient care environment. The investigation is intended to assist health care executives in understanding the key elements of a successful MPS strategy in order to generate millions of dollars in cost savings, improve print processes, ease the transition to electronic health records and operate more efficiently. The white paper provides essential criteria for evaluating MPS partners and discusses the value of a print program where people, processes and technology are equally considered. In addition, the white paper keys in on the benefits of using "Kaizen Lean" methodologies, a philosophical approach used globally to improve business operations, to ensure effective change management and the successful transformation, culturally and technically, of a hospital's complex print infrastructure and operating environment in order to deliver ROI. The "Is your Managed Print Services program sustainable?" white paper is publicly available as a PDF download in the Press section of AUXILIO's website. For further information regarding AUXILIO or Managed Print Services, please visit www.auxilioinc.com.